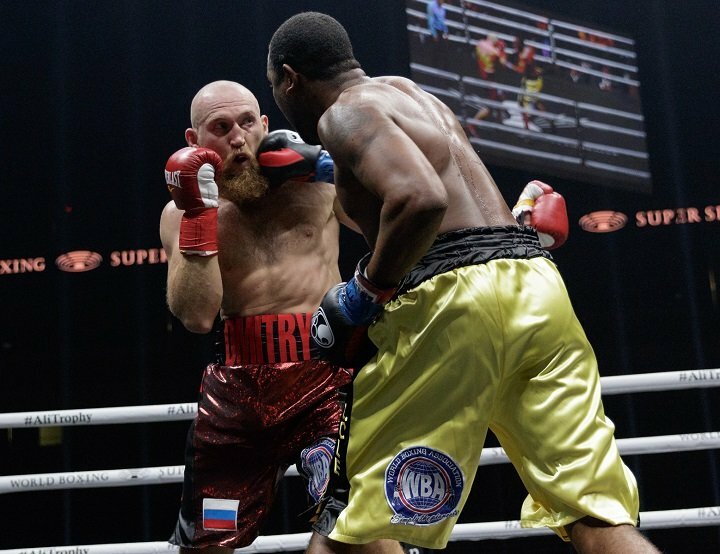 Last night is San Antonio, it was a case of, ‘As Advertised.’ Fighting in The World Boxing Super Series tournament, cruiserweight bangers Yunier Dorticos of Cuba and Dmitry Kudryashov of Russia met in center ring and basically traded bombs from the very start. Fans knew this one would not, could not, last long, and it didn’t. A crushing overhand right from the unbeaten Dorticos send “The Russian Hammer” down, badly hurt in the second. The short and sweet slugfest was all over at just 2:10 of round-two. Both men wanted to put on a show of power in their WBSS debut, but it was Dorticos, now 22-0(21) who had the faster hands, the better overall skills. Kudyashov, a classic example of a fighter who can take out anyone he hits clean but can also be taken out by anyone who hits him clean, was hurt early on in the 2nd, and, as he showed in his other loss – a second-round stoppage loss to Olanrewaju Durodola – Kudryahsov doesn’t really know what else to do when hurt but try and fire back with his own shots. Dorticos will now face the winner of the Murat Gassiev-Krzysztof Wlodarczyk quarterfinal that will take place in Newark, New Jersey on October 21. With the kind of power and speed he displayed last night (albeit against a fighter who had, in the opinion of some critics, previously been “exposed” as being somewhat vulnerable) Dorticos is naturally feeling very confident. In light of the recent tragedy in Mexico, that last remark may be taken as offensive by some. However, Dorticos’ power and punch-precision got the job done in some style last night. As for the vanquished Kudryashov, now 21-2(21) it could be a long road back. Simply knowing only one way to fight, Kudryashov will face a tough task in beating any top contenders in future fights, his brutal punching power not withstanding.